Sauté onion until tender in olive oil. Dice chicken breast into bite-sized chucks and add to onions. Cook until done, about 10 minutes. Add remaining ingredients. Allow to cook for about 20 minutes, and then taste. Season it to your liking and cook for 40 minutes more, or longer. The longer it cooks, the better it tastes. Serve with lowfat Mexican blend cheese and lowfat sour cream. Enjoy! Very yummy, spicy. Left out salt and used low sodium broth. Will do again! Wait a minute? Does this REALLY have over 2,000 mg of sodium? Is that a typo? Why is this recipe on here? And why does it have three stars? I'd give it negative stars if I could. 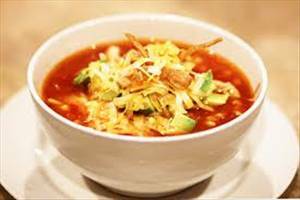 There are 275 calories in 1 serving of Chicken Tortilla Soup V.
Calorie break-down: 17% fat, 26% carbs, 57% protein.